The atheist PZ Myers giving a talk at George Mason University. 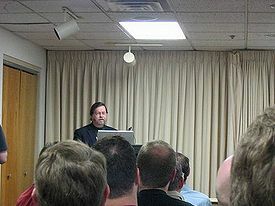 In June 2010, PZ Myers commented that atheist meetings tend to be significantly more attended by males. In addition to the disseminating of ideas, conferences often reflect the type of people that are involved in a given population/community and the status of various individuals and sub-groups within a population. Many atheists in theistic societies feel isolated and so internet atheism and conferences may be potentially more important to some individuals such as people who lack atheist friends and family members (See: Atheism and loneliness). Over recent years, the atheist community has sought to resolve issues of diversity within the movement. Since 2008, atheist conference organizers have made efforts to invite more racial minority speakers and more women speakers. The prominent atheists Richard Carrier and PZ Myers have written about inappropriate sexual activity which occurs at atheist events (see: Atheist conferences and inappropriate sexual activity). Atheism is more prevalent among men than women (see: Atheism and women). Post-Elevatorgate more attention was given to atheist conferences and peoples behavior at atheist conferences among atheists. For example, Post Elevatorgate, atheist conferences frequently have anti-sexual harassment policies. However, the incident mentioned below reflects that prominent white men, still exert considerable influence within the atheist movement despite the fact that atheists tend to lean politically left and that the left purports to strongly support gender and racial diversity (see: Atheism, social justice and hypocrisy). In June 2010, the atheist PZ Myers commented that atheist meetings tend to be significantly more attended by males. In October 2012, the atheist Susan Jacoby wrote in The Humanist concerning atheist meetings: "When I speak before non-college audiences — that is, audiences in which no one is required to be there to get credit for a college course — 75 percent of the people in the seats are men." Jamila Bey said about being a black atheist, "It's one isolating experience." “ ...for a couple of centuries, African-American culture has been imbued with Christianity. The church figured prominently in both the abolitionist and civil rights movements. And today in many communities, the Christian church continues to be the nucleus of black life. So, what about the black nonbelievers? It's one isolating experience, according to Jamila Bey. ↑ 1.0 1.1 Myers, P.Z. (June 29, 2010). "The woman problem". Pharyngula [blog]. ↑ Jacoby, Susan (August 16, 2012). "A woman’s place? The dearth of women in the secular movement". The Humanist website.